CANADIAN REGION: What are you doing in JULY 2017? Re: CANADIAN REGION: What are you doing in JULY 2017? In case anyone is worried about where I live, I am situated about where the capital C is in Columbia River. Well away from the nearest fire. Mind you, everywhere is dry as a bone in spite of the damp spring and lots of snow in the mountains last winter. Just a hint of smokey looking haze early this morning but I could not smell any smoke. Are any of our British Columbian gardeners anywhere near these fires? Temperatures today are mid-30Cs and tomorrow a 20% chance of rain for a couple o days then beck to clear skies and very high temps once more. Good news that you are out of harm's way, KJ! Glad to hear you are safe Kelejan! I'm originally from Edmonton and my family would take yearly road trips to Vancouver to visit relatives so I know how dangerous those fires can be. Stay safe! I'm glad your community is safe. It seems to me that the only good thing about these fires is that it gets rid of fuel accumulation so there is less risk of fires for a while. It is Nature's way of keeping things under control. It doesn't help that it involves people losing their homes and livelihoods and sometimes their lives. Our forecast is lightening and 30% chance of rain for tonight and tomorrow. The wind has risen and the sky has darkened. Yesterday I managed to mow my lawn so I am hoping for lots of rain to cool things off. I do not function too well in 35Cs +. 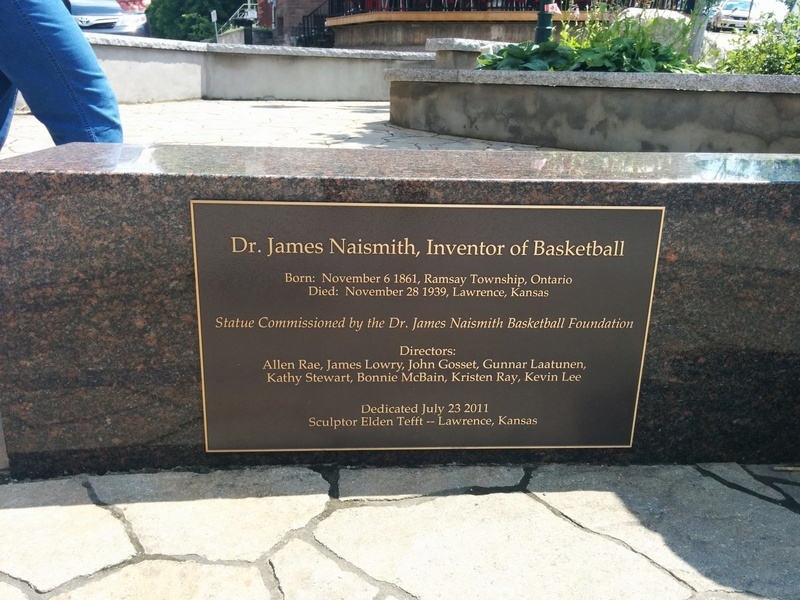 This morning Mrs TD and I took the short drive (about 35 minutes) to Almonte, Ontario which is the birthplace of Dr. James Naismith, the inventor of basketball. 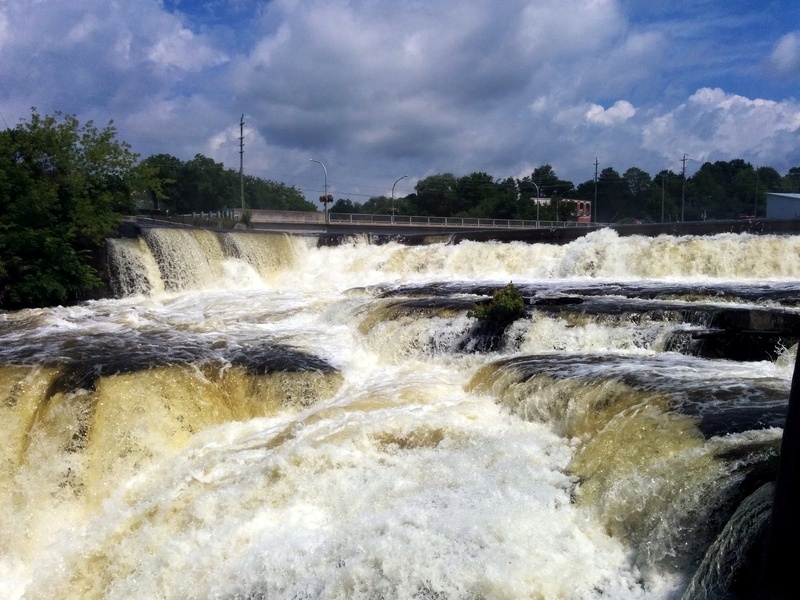 Due to all the rain the Mississippi River, which flows through the town, was a raging torrent. @Mimi2 wrote: Help. My cucumbers have lots of flowers but no baby cukes growing yet. What can I do? Mine are getting flowers as well. So far I only see what look like male flowers. There are no female flowers which have miniature cukes between the stems and the flowers. If necessary,hand pollinate when the female flowers appear. Thank you TD. Very helpful tips and videos. It is too late for me to inspect the flowers, but I suspect that many of them are male. A potential problem that my mom had last year with cukes is that some varieties are bred to ONLY produce female flowers, as on my female produce fruit. For pollination of these varieties the seed company will add another variety that has make flowers. Usually 10% of the seeds are these pollinator varieties (do really you only get 90% of the variety you wanted). Where you can have an issue is if you only have 2 cuke plants, you could very well end up with no male flowers. Sometime you get lucky though, and a close enough neighbor has make cukes flowers. But to avoid this situation I decided to plant one I know produces male and female flowers. @Robbomb116 wrote: A potential problem that my mom had last year with cukes is that some varieties are bred to ONLY produce female flowers, as on my female produce fruit. For pollination of these varieties the seed company will add another variety that has make flowers. Usually 10% of the seeds are these pollinator varieties (do really you only get 90% of the variety you wanted). Where you can have an issue is if you only have 2 cuke plants, you could very well end up with no male flowers. I had no idea! I have not had a problem! I grow Beit Alpha and this year Indian Dance? Or something like that. Gynoecious is the term that means all female flowers. So it s a term to look out for if it's the only variety you're going to have. On the flip side if you havr a few varieties , and one for sure produces male flowers, that one variety could pollinate the others. In that case a gynoecious variety could really increase yields as all the flowers should form cukes! @Robbomb116 wrote: Gynoecious is the term that means all female flowers. So it s a term to look out for if it's the only variety you're going to have. On the flip side if you havr a few varieties , and one for sure produces male flowers, that one variety could pollinate the others. In that case a gynoecious variety could really increase yields as all the flowers should form cukes! Parthenocarpic varieties are gynoecious but do not require a pollinator or pollination to set fruit. I grow Botanical Interests - Cucumber Persian Baby. There are male and female flowers on each plant but you don't have to worry about pollination. The female flower does not need to be pollinated by male flowers. Whoa, TD. That raging torrent must've been loud! Cool picture! On the cuke front, I'm growing Marketmore 76 cucumbers. I've got 8 plants that all have male flowers now, and I see 2 or 3 females that are in various stages of, shall we say, receptiveness, lol. None with open flowers yet. Hope they come in soon before the male flowers decide to drop! What am I doing today? Well I'm playing in the rain (again). I've also come to a conclusion. The light bulb went on as I was reloading my SoilSaver compost bin. The conclusion is that I am better at "growing" compost than I am at growing veggies. I spend at least 80% of my gardening time accumulating materials for composting, filling compost bins, turning compost materials, measuring compost temperatures, emptying compost bins, sifting compost, using compost in the SFG and other gardens. My whole summer revolves around compost. The other aspects of gardening are just sidelines. It's like compost is some kind of addiction. Td, Isn't that the truth! But, isn't success at SFG gardening all about the compost? Ha ha. I agree about the compost. My gardens are doing great this year. And I think the home made compost is a key ingredient. 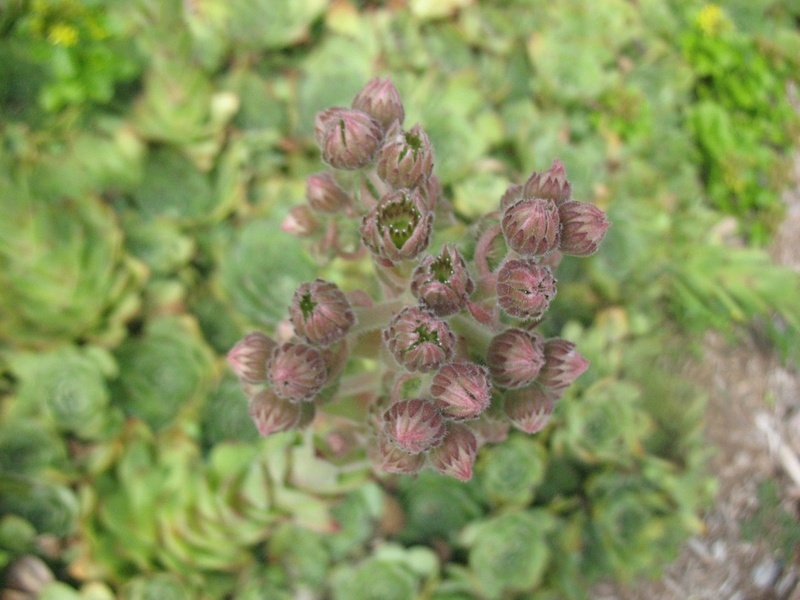 Someone posted photos of Hen & Chicks flowering but I could not find the thread. 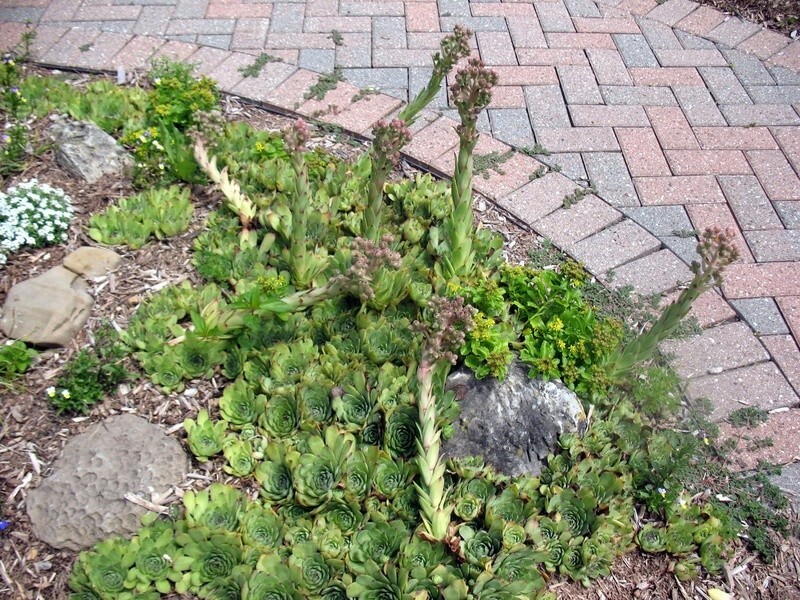 Ours have grown huge flower stalks about a foot long. 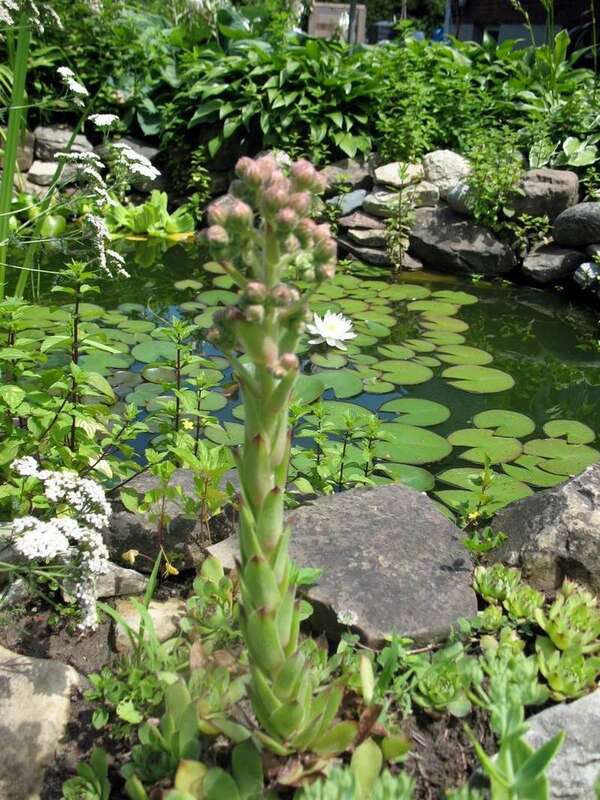 We have them growing in the small rock garden at the front of our house as well as in the rocks at the pond in the backyard. KJ, It looks like you finally have some sun. @sanderson wrote: KJ, It looks like you finally have some sun. Sanderson, I wrote that on July 10th saying that I was looking forward to rain; but it did not arrive as it bypassed us and went to the next to the adjacent city of Trail, about half an hours ride away. so we have had some sweltering weather day after day. No rain for several weeks and of course we are on limited watering times, not because we are short of water but we are short of water carrying capacity. If everyone watered when ever they wanted, the system would be on overload. Some people would water their grass as well as the road side every day. I never water my grass and it still comes back good when the rain and the cooler weather return. In 2017 we are going on metered watering, and it will be interesting to see if these water wasters complain. As a minimum water user I still bet that I will be paying almost as much as the more prolific users. Still no rain and today we have a bad air warning, number 7/10 compared to Williams Lake which has a bad air rating of 10/10. Up to now we have had clear skies but it is catching up with us with the winds coming from the north west which means that in Williams Lake where 10,000 people have evacuated to Kamloops, the winds are passing through south east to us. Still a long way from where I live but somebody said to me yesterday, there's not too much left to burn so we hope that it will not reach us. Our air quality rating improves tomorrow to 5, then the following days it will be 2. Today we elders are supposed to take it easy, so I am taking their advice. Tomorrow I am going raspberry picking as I have done for the past few years with my friend Diane, to her friend Paul's piece of land up in Pass Creek. He grows loads of stuff just for the fun of inviting friends up to help themselves. Every year I get green beans, carrots, corn, beets, etc. as well as the raspberries. I give him canned peaches which he loves as he does not have peach trees. I feel for the British Columbians being out of their homes and wondering if they will be lucky enough to return their homes. I see the long line-ups in Kamloops where thousands of them are stand in line to register and then having to sleep in cots in the reception centres. There is no quick end in sight for them. I pray for them. Much clearer air today thank goodness. I expect the reading of the air quality will be down to the 2 predicted. It feels cooler too, almost felt chilly yesterday evening when I took the neighbour's dog for his evening walk and last night I had to add a light blanket over the one sheet I had been sleeping under for the last week or so and the cat decided he wanted to sleep on my bed again. I will be mowing the lawn again as the grass is greening up a bit in places, and then I will start thinking about some fall planting and preparing the beds. Some people are able to return to their homes after the fires to to face the rather bleak landscape that fires produce. But everything will return to green in time and let's hope more though will be given to what happens trees are allowed to too tall near their homes. I look around my home and see how vulnerable my house is due to the row of tall cedars next to my boundary. The wind in the wrong direction would wreak havoc. All the smoke from the B.C. Interior is going down to Vancouver and also across to Alberta etc. Sorry about that, fellow Canadians. KJ we are all happy you are safe and hope and pray you will remain so. It must be very difficult for those who have been evacuated and especially for those who return to destroyed or damaged homes. Calling SwampTroll ... Hello, are you there SwampTroll? I sent you a PM a few days ago concerning the poppy seeds? If you would like some, I need your address. Sorry, you caught me on my days off and well, I spent them out in the garden as much as possible. Yes, thank you! You've made my week that much better. I have cucumber flowers! Unfortunately I have not been able to get a decent angle on them to figure out if they are male or female flowers. Also my corn has started to grow tassels! This is disconcerting as they aren't very tall and I'm not seeing any silks or ears yet. My Hopi Red beans are lounging about. I'm beginning to wonder if they're competing with the corn for light. My peppers have also started to flower as well. Amazingly, I also have 1 bulb of garlic that's *still* hanging on by a thread.